World's No.1 SAEPLAST Insulated boxes/Shippers are used and recommended for transportation, distribution & storage of temperature sensitive products like Ice cream, Frozen food, Milk products, Chicken, Fish, Frozen meat, Vegetables and is a necessity in all areas of Food processing industries. 50, 60, 70, 100, 110, 125, 150, 220, 260, 310, 460, 660, 1000 & 1610 Lit. 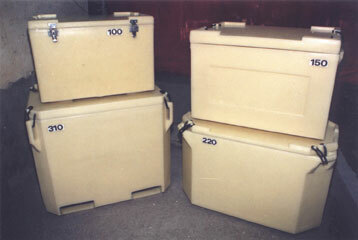 PUF insulated double walled boxes. Superior Quality & aesthetics. Specially designed rubber strap for air tight lid. Strong and rugged designed for rough handling. Safe and hygienic for storage. Special drain valve available for easy cleaning.